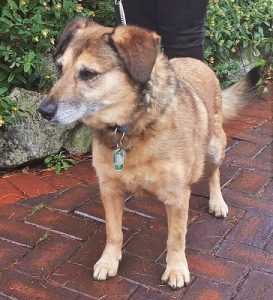 Lovable George is a 9 year old crossbreed boy who came into the care of Pattering Paws Dog Rescue in the West Midlands, as his owner was too unwell to look after him. He’s looking for a relaxing retirement home as an only pet and with no children. Occasionally visiting, sensible ones should be OK for him. He’s a very loving boy and had been the apple of his owner’s eye. George is well behaved the house and travels well in the car. On walks, he can be strong on the lead so he needs an owner who’s active. He’s not a fan of other dogs and must be walked at quiet places or times of day, so he’s unlikely be bothered by them. With patience and careful handling, he will walk along beside another calm dog though. He just doesn’t trust unknown ones with their hidden machinations! George is such a lovely boy – affectionate and loyal. He’ll be the best companion you could wish for, completely devoted to you and an excellent listener. 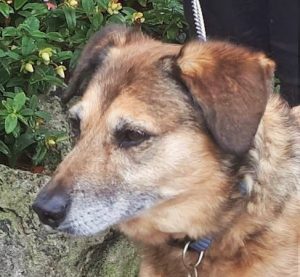 Please say you saw George on the Oldies Club website.